Men’s Health Women’s Health(MHWH) Night Run by AIA Vitality is back! The 2017 Men’s Health Women’s Health Night Run by AIA Vitality, which was originally scheduled to be held in Dataran Putrajaya, has now been moved to the Malaysia Agro Exposition Park Serdang (or MAEPS). This change is in support of the Prime Minister’s Department’s plan to host the 60th Felda Settlers’ Day National Celebration in Putrajaya which falls on the same date. While it is disappointing that we are unable to continue to host the run in Dataran Putrajaya this year, we are nevertheless excited with the new venue which we have carefully chosen together with the team from Men’s Health and Women’s Health. MAEPS is an ideal alternative to Putrajaya as it offers a new and exciting experience with its idyllic and picturesque routes. The venue is set a mere 15 kilometres away from the original flag-off point at Dataran Putrajaya and has been specifically selected to minimise any disruption to your travel arrangements. There will be no change to the run date which falls on the evening of Saturday, 22 July 2017 or to the distances and categories available. Please check Men’s Health Malaysia and Women’s Health Malaysia events page and social media platforms for more information including running routes, flag-off times as well as other new updates. We apologise for any inconvenience this may cause and we would like to assure you that we will work toward making the run a great success for everyone. See you in MAEPS SERDANG on 22 July! Last year, MHWH Night Run was a TERRIFIC trifecta affair as it was staged in Penang, Putrajaya and Johor. I was lucky to have participated in the Penang’s edition which was a MEMORABLE event with lots of food, music and merriment to entertain the crowd. I recall fondly the 21km route which gave the runners a scenic view of the breezy Penang coastline. The race was well marshaled, and I remember the exciting party atmosphere at the race village prior and after flag-off. This time, the Event Organiser Mongoose Publishing have amalgamated all their efforts and resources in order to concentrate on one EXTRAORDINARY event to be held in MAEPS SERDANG on 22 July 2017. MHWH Night Run 2017 will be a grander affair which will entice 20,000 Runners and Revelers for a SPECTACULAR evening of Running and Partying in the heart of magnificent Putrajaya. Men’s Health Women’s Health Night Run by AIA Vitality expands with new exciting category for kids! One of the most anticipated night runs in the country is back! 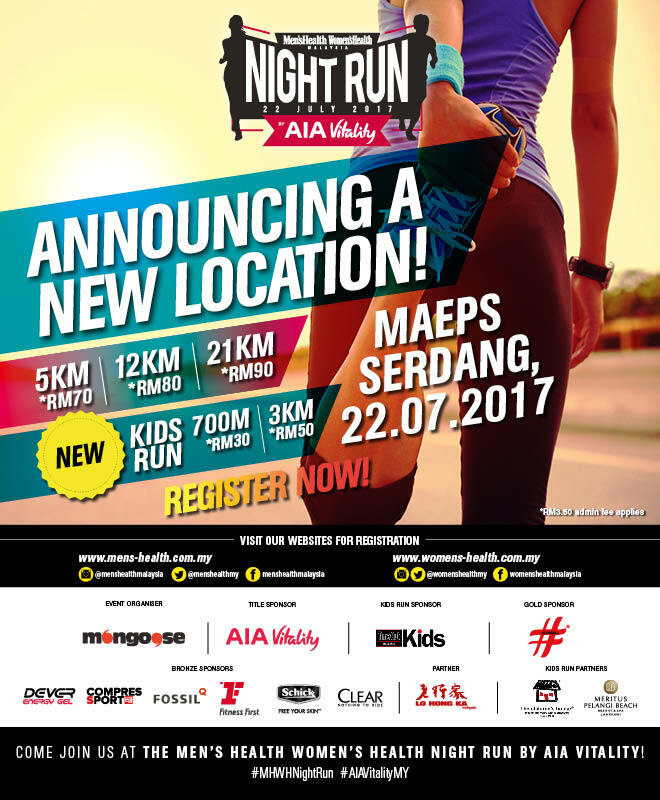 The Men’s Health Women’s Health Night Run by AIA Vitality will return to MAEPS SERDANG this 22 July 2017, and has introduced an exciting new category exclusively for kids aged 7 to 15 years old. Now families can participate and spend precious time with their young ones! Especially for you, we are offering 30% off for the Followers of Happy Runner!! Simply use the pin code below when you register online. For Online Registration And More Information On Men’s Health Women’s Health Night Run by AIA Vitality. For Event Updates, visit FB Men’s Health Malaysia or Women’s Health Malaysia. Men’s Health Women’s Health Night Run by AIA Vitality expands with new exciting category for kids. Men’s Health Women’s Health Night Run by AIA Vitality returns to Putrajaya this July with the addition of kids’ races open to children aged 7 to 15 years old. Kuala Lumpur, 13 April 2017 – Men’s Health Women’s Health (MHWH Night Run) Night Run, one of the most anticipated night runs in the country held in partnership with AIA Vitality (#AIAVitalityMY), will return to Putrajaya this 22 July 2017, and will introduce an exciting new running category exclusively for kids aged 7 to 15 years old. Now in its third year, Men’s Health Women’s Health Night Run by AIA Vitality is making a comeback, promising some 20,000 runners another exciting race (5km, 12km and 21km) in the Men’s and Women’s Open and Men’s and Women’s Veteran. The first flag off will be at 6.00 pm and the last flag off at 8.40 pm. In conjunction with the second year anniversary of Time Out Malaysia Kids, a quarterly magazine for families with kids, this year’s installment of Night Run invites families to spend time with their young ones at an action-packed and fun-filled Saturday. Kids ages 7 to 12 may participate in the new 700-metre race, and 13 to 15 year olds for the new 3 km race. Men’s Health and Women’s Health will continue to team up with AIA Bhd. who is returning as the official title sponsor. The run will be under AIA Vitality – Malaysia’s first science-backed health programme designed by AIA to encourage and empower Malaysians to take sustained steps towards healthy living lifestyles. It is gratifying to see how the continuous support of Malaysia’s running community has made the Men’s Health Women’s Health Night Run by AIA Vitality the biggest night run in the country, says Patrick Brennan, Group CEO of Mongoose Publishing Sdn Bhd, the publishers of Men’s Health and Women’s Health in Malaysia. This is the second-year of our collaboration with AIA Vitality and we could not have found a better partner as AIA shares our passion, drive and ambition to create an event that reaches more Malaysians than ever before. The AIA Vitality wellness programme is perfectly designed to give an extra push to all Malaysians to live a healthier lifestyle and we are delighted to share this journey with them. AIA Bhd.’s Chief Marketing Officer, Eric Chang explains, At AIA, we are committed to helping Malaysians live longer, healthier, better lives. We are absolutely thrilled to host this year’s Night Run in Putrajaya under the AIA Vitality banner together with Men’s Health and Women’s Health teams again. AIA Vitality is about taking charge of one’s own health, however small, and being part of the Night Run is an excellent way to get Malaysians started on their journey to better health. With the new kids run categories, we are also able to encourage our children to lead healthy and active lifestyles, besides giving families another fun activity on the weekend to spend precious time together. While preparing for their endurance run, participants can enjoy browsing through sponsors booths whilst listening to music specially curated by a DJ. Attendees can also satisfy their appetites with food trucks parked on site. Families and friends who are there to show support and cheer on participants are also welcome to join the fun-filled Saturday at the village and keep the festive spirit going. Participants will each receive an exclusive running t-shirt from performance sports brand, Ultron. For those who complete the run, they will each receive a medal, and a special goodie bag which consists of merchandise and vouchers. Major sponsors – including health club, Fitness First and personal care and safety razor brand, Schick – will contribute products and experiences to support the participants health and well-being. Gus is the Founder of Running Toons and a HIIT Fitness Coach. As a freelance WRITER, he has contributed numerous insightful articles to The Star newspaper, Running Malaysia magazine, Cycling Malaysia magazine, Cycling Evolution magazine, Swim Bike Run magazine and more. LIKE Happy Runner for RUNNING UPDATES, Gus Rider for CYCLING NEWS, Gus Ghani for SPORTS INFOTAINMENT and FOLLOW gusghani@IG for LIFESTYLE. This entry was posted in 12km, 2017, 21km, 3km, 5km, Event, Event Organiser, Family, Fitness, Food, Funny, Half Marathon, Happy Runner, health, July, Lifestyle, Magazine, Media, Night Run, press release, Running, Running Community, Running Event, Uncategorized and tagged 12km, 21km, 5km, AIAVitalityMY, Family, Fitness, happy runner, health, July, kids, Media, Men's Health Malaysia, mhwhnightrun, Mongoose Publishing, night run, Putrajaya, Running, Women's Health Malaysia. Bookmark the permalink. 1 Response to Men’s Health Women’s Health(MHWH) Night Run by AIA Vitality is back!